It seems only proper that there should be a section in every progger's stash of music that caters to the more contemplative and peaceful side of one's consciousness. In my case Iona more than fulfills that need. Their sound has what I like to describe as a "depth of field" that captivates and draws me into their mist-shrouded world every time I listen to them. To consider them boring would be a mistake because it would indicate that you aren't paying close attention to the myriad of different instruments that are swirling in the mix. Their skillful blend of modern and traditional influences is very respectful, unique and creative. Some have labeled Iona's offerings as being too religious in nature but I disagree with that pigeonholing. While I don't deny that they obviously derive much of their inspiration from the Christian realm, this is spiritual music for the soul, no matter what you believe in. They begin the album in a mystical atmosphere as Mike Haughton's lone recorder slowly appears like a soft, welcoming lighthouse beacon on a foggy shoreline amidst Terl Bryant's eerie, ancient percussion devices. Soon Dave Bainbridge's heavenly keyboards arrive in force to make "Prayer on the Mountain" an impressive start to the journey. They segue seamlessly into "Treasure" with gargantuan guitars and rhythmic drums paving the way for Joanne Hogg's inimitable voice to take you hostage. She is the golden heart of Iona and if you haven't heard her sing yet then you need to. Here Terl's drumming is surprisingly aggressive and sets the tone for much of the CD. Another admirable characteristic of this group is the poetic quality of their lyrics as they express things you don't often find being addressed in other prog formats. Like grace. "If a son asks his father on earth/for fish or for bread/who among you would give him a snake or a stone?" she sings, "How much more does the father above/have a heart full of love/for the children that he calls his own?" That's good stuff. A spacey intro leads to a majestic melody in "Brendan's Voyage (Navigato)" and then a 12-string acoustic glides beneath Joanne's strong voice as she describes making preparations to strike out on a risk-filled quest, something most of us can relate to at one point or another in our lives. It also has one of those "shimmering" fadeouts that I adore. "Edge of the World" is my favorite tune on the album. It's a beautiful ballad about leaving behind the safe and familiar for the great unknown. "Shall I turn my face/towards the shining sea/taste the salt of tears/for those I have to leave." she laments. On the memorable chorus the band employs intriguing kicks and accents that bring to mind what Peter Gabriel did on "Don't Give Up." The song is an absolute stunner and Haughton's soprano sax at the end is a joy. Up-tempo percussion roiling under Hogg's unadorned vocal on "Today" comes next and the stirring string score gives this number a distinct, traditional Irish flavor that is warm and welcome. It's yet another standout song. The soothing instrumental "View of the Islands" follows and it's a gorgeous duet between Dave's acoustic guitar and Mike's ethereal recorder. "Bird of Heaven," the album's longest and most engaging track, opens with lush keyboards surrounding a tenor sax before transitioning into a rockin' 9/8 segment that is exhilarating. The folkish verse and chorus concerns itself with the error of trying to coop up the acme of one's faith in the cage of suffocating dogma. "Lock him in religion/gold and frankincense and myrrh/carry to his prison/but he will be gone" for universal truth is ever-evolving/expanding and "still the bird is flying as before" Hogg sings. The grand ending is towering and cavernous with Bainbridge displaying not only his keyboard prowess but also his admirable guitar virtuosity. This man is a truly gifted and multifaceted musician. "Murlough Bay" is no let-down, either. Here Joanne's angelic voice accompanied by fluid acoustic piano is a subtle treat, especially when she sings triumphantly "And here at last/I'm on my own with you..." But just as they nearly lull you into a meditative state the tune literally bursts out into a drop-dead- gorgeous chorus that rivals any group residing in the symphonic prog wing of the archives. It is stunning and a real eyebrow-raiser. It's darn near impossible to keep up this level of intensity so it's not surprising that "Burning Like Fire" slows the momentum some as it's a fairly pedestrian trek into pop. Dave performs a hot guitar ride but it's not quite enough to elevate this song above average. The peaceful instrumental "Adrift" follows with dense keyboards and piano layered over sounds of a wooden boat creaking in the calm waves, creating a lonesome but nonetheless comforting mood. A famous lover's leap on the south coast of England is the inspiration for "Beachy Head," another tune that ventures perilously close to being MOR "contemporary" (but perhaps it merely reflects the prevalent music style of the early 1990s). The ending with Haughton's sax wailing away is emotional and heartfelt, to be sure, but it grows to be a bit overwrought before the abrupt stop comes, symbolizing the final suicidal dive of one of the heartbroken souls that tragically ended their life on the rocks at the foot of the cliffs. "Machrie Moor" is a lovely instrumental featuring guest Fiona Davidson on Celtic Harp and the band's livelier, uplifting side is showcased on the spirited "Healing" where Hogg's elated delivery of lines like "A time will come when the pain will go/A time will come when the love will flow/A time will come when your heart will know. Healing" is hard to ignore. Their performance of "Brendan's Return" is a gallant reprise of the earlier cut, this time without vocals but with exciting, tight rhythm section work from Bryant and bassist Nick Beggs and a thunderous, dynamic arrangement by the band. Once again Dave's piercing guitar cuts like a knife. The finale and title track, "Beyond These Shores," starts with Joanne singing by herself and the effect is amazing. Soon she is joined by the string section, piano and deep keyboards that will carry your soul out of and above your daily existence. And, as Bainbridge's exquisite piano drifts away into the Irish mist, you are left with a feeling of serenity that is elusive and rare. I consider their incredible album that preceded this one, "The Book of Kells," to be more consistent and mesmerizing but I don't state that in order to disparage this CD in any way. "Beyond These Shores" is an exemplary work of aural art. 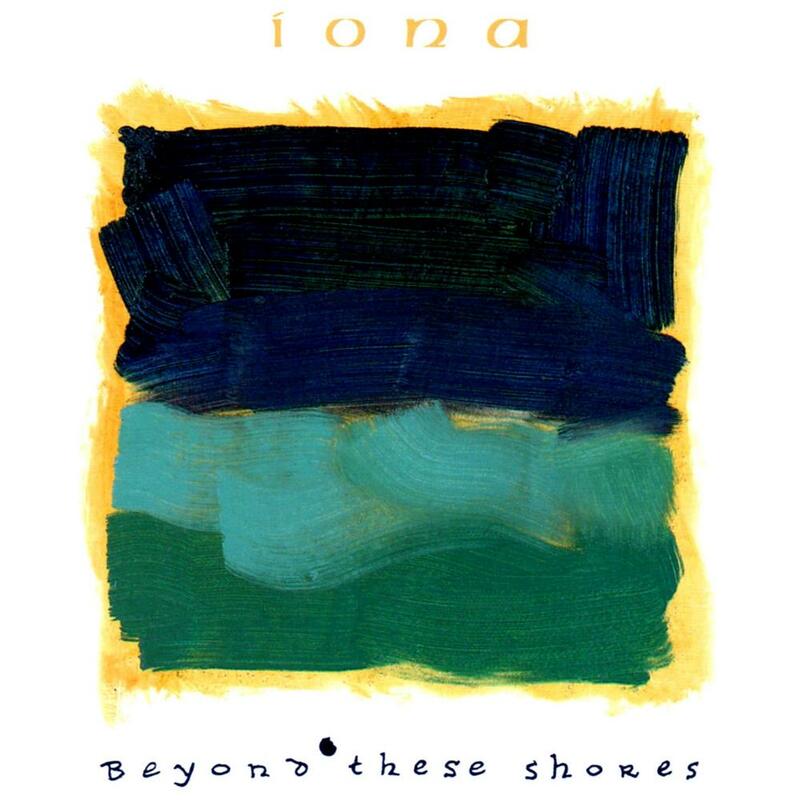 If you have yet to discover the sublime pleasure that is Iona then I urge you to do so. (Can any album that Robert Fripp takes part in be anything less than high quality?) While it may not be something you'll get the yen to listen to as often as say Yes or Pink Floyd there will most likely come a time in your existence when cerebral and inspiring music will be exactly what you're wanting and needing to hear and you'll be glad you have this album in your prog collection. 4.5 stars.